Is this car for sell? Million, and a Large pull barn to save all these. Nice Bel Air beside it. I'd need a kick in the rear to see if I was dreaming. That 37 coupe looks as good as my 37pu beater.Had four 57 chevy cars and the reason someone thought the BelAir a 210 is the center chrome is so light in the pic or gone.BelAir has the chrome on the top of the rear fin all the way to the rear glass were as a 210 is a short piece on the fin.Lots of 210 owners put the Belair side chrome in the middle.My last 57 was the only one not a true BelAir but the owner before me added the side chrome. That is a great 37! It is a Bel Air. 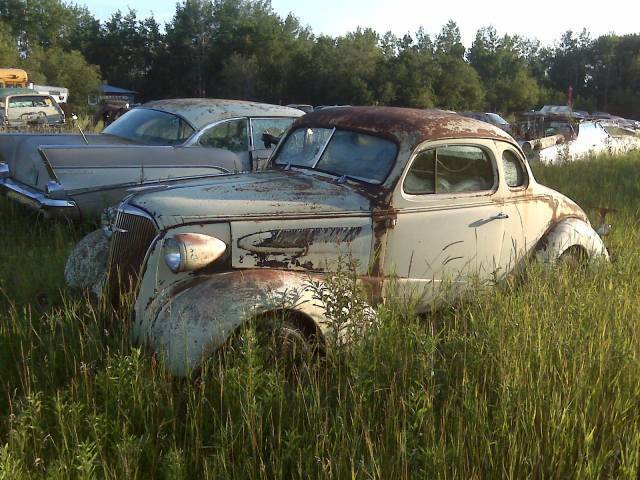 There were 26 other tri-five chevy's in this field. I believe it's a Bel Air. I'll take 'em both....alot of potential sitting there wasting! This would make an awesome rod... of course so would the 210 hardtop beside it.